Camila K. Janniger MD was born Kamila Barbara Krysicka in the elegant Baltic seaside resort-town of Sopot. Camila was raised in Warsaw, where she completed all her education, graduating from the Medical University of Warsaw in 1984. Her career began with a rotating internship at the Albert Einstein College of Medicine, Montefiore Medical Center, followed by her dermatology residency at the New Jersey MedicalSchool. Dr. Janniger is board certified in Dermatology. She was appointed Clinical Assistant Professor and Chief of Pediatric Dermatology in 1990, and was promoted to Clinical Associate Professor of Dermatology and Pediatrics at the New Jersey Medical School in 1995. She was promoted to Clinical Professor in 2002. She has been a member of the editorial board of Cutis since 1991. In 1992 she was named as founding Pediatric Dermatology editor , a position she retains. She is also a member of the editorial boards of SkinMed, Mikologia Lekarska (Medical Mycology) and Dermatologia Kliniczna (Clinical Dermatology) and is a managing editor of eMedicine Dermatology. She has edited or written 4 monographs, and is the author of 35 book chapters, 145 articles and 21 other publications. Her latest monograph has been published by the British Medical Journal. She was elected a Charter Member of Sigma Xi, the Scientific Research Society, New Jersey Medical School Chapter, is a Fellow of the American Academy of Dermatology, served a three year term as a Member of the National Tuberous Sclerosis Association Professional Advisory Board, and was named to Who's Who in Medicine and Healthcare in its first edition. 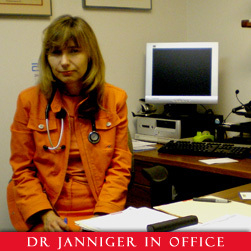 Dr. Janniger sees private patients in her office at 42 Locust Avenue, Wallington, New Jersey 07057 (click link for directions).